Pure Jongo A2 hi-fi adapter makes any hi-fi wireless | What Hi-Fi? The Pure Jongo A2 wireless hi-fi adapter has been officially launched, becoming the second product in the Pure Jongo wireless music system family. The Jongo A2, on sale now for £100, acts as a wireless adapter for any existing hi-fi system, allowing you to stream music via wifi or Bluetooth from Android and iOS phones and tablets, using the free Pure Connect app. Following the launch of the Pure Jongo S3, a portable wireless speaker which can form a simple multiroom system when partnered with more Jongo S3 speakers, the A2 allows you to add existing systems to your Jongo wireless system. The new Jongo A2 has a "high-quality 24-bit internal DAC", as well as RCA phono analogue and digital coaxial and optical outputs. Jongo speakers use wifi to play music individually or synced across multiple speakers. Bluetooth enables you to stream music from any app or music on your phone or tablet's internal storage. Pure is also hoping the Jongo speakers will push its own streaming music subscription service, Pure Music, which combines on-demand music and radio. There's a free 30-day trial, too. 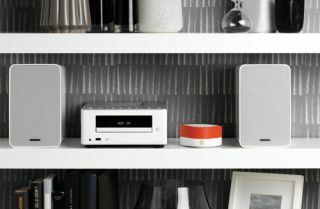 The Pure Jongo family was first revealed at CES at the start of the year, seeing Pure branch out further from its original digital radio brief and following the launch of Pure docks and PVRs.